Methamphetamine drug arrests ripple out to affect a wide circle of innocent people beyond those charged with crimes. Children lose parents. Family members suffer mental and financial anguish. Investigators risk chemical poisoning. These are the most prominent victims, but in the background there's one more. The property owner who must pay for cleanup. Hills, Minn. — Through new fallen snow, Charlie Sandager approaches the scene of a meth bust. It's an old farm house he owns near the town of Hills in southwest Minnesota. A man rented the house from Sandager. No one has lived there since the November raid. Sandager finds evidence however of vandals. "Oh yeah, they did bust that window," says Sandager. "This used to be a stained glass window." Law officers found a methamphetamine production lab. Part of it was in an old corn crib. "I think there was something going on in this room back here," says Sandager. Two buildings and the house were posted after the raid. No one can live there until the structures are tested. Testing alone costs $1000. If meth residue is found, the house must be cleaned, an even more expensive step. Rugs and other absorbent materials are thrown out. Hard surfaces are scrubbed. Soft surfaces like plaster walls are given a coat of sealer. Back at his own house, sitting at his kitchen table, Sandager says he's found out it's very expensive to clean a meth house. "Well, they said the cleanup would be from $5,000, maybe running up to $10,000," says Sandager. Sandager says, at most, the old farm house is worth $20,000. He says instead of testing and possibly cleaning he'll probably have the place destroyed, burned down. He says local authorities have told him he can do that legally. "It just doesn't seem fair that the landlord should be held responsible," says Sandager. A new Minnesota law taking effect January 1st places the cleanup responsibility on property owners statewide. Until now county ordinances have held landlords like Sandager accountable. State Representative Jeff Johnson says lawmakers struggled over the cleanup portion of the meth bill. He says it's consistent with state law in other areas. Johnson, who's running for attorney general, says landowners usually are responsible for cleaning up their property even when they do not cause the damage. "Bottom line, it has to get done, it's a public safety issue," says Johnson. "You do have situations where if you have a landowner who, something happens to their property to damage it, the government usually doesn't step in to help them out." Johnson says state law allows landowners to recoup cleanup costs from the meth offender, but he admits in most cases the criminal is broke. There also is a revolving loan cleanup fund in the new meth law, which may offer some help. And the state's superfund may help pay to decontaminate water and soil. Johnson says the law puts the burden on the landowner to pay close attention to their property. He says sometimes a landowner legitimately has zero knowledge of drug activity on their property, he calls that the innocent property owner. "In many cases the property owner's aren't innocent," says Johnson. "In many cases they either knew about it or they should have known about it." "It's been a learning process, it's been a nightmare." Charlie Sandager felt the bite of this simple bit of logic. It's straight-forward and should be easy to apply. When it meets the drug culture things get murky. It can be hard to figure out exactly what the renter is doing in a world where too often the closest thing to truth is a sincerely told lie. Some might say Sandager is too-trusting or too big-hearted. 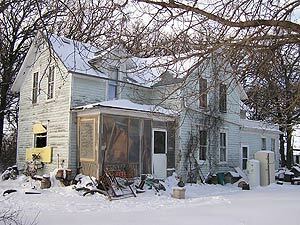 The November bust wasn't the first time there had been drug arrests at the old farm house. Six years ago, law enforcement arrested the same person at the farm on a drug charge. Sandager questioned the man when the offender got out of jail. The offender lied. He said he'd been arrested for having meth making ingredients. He said he was innocent, that the ingredients found were simple household cleaners common to most homes. Sandager believed him and allowed the man to move back into the house. But court records show the drug itself, methamphetamine, was found. When told this recently, Sandager said it was the first time he'd heard it. He said he felt used. After the man returned from jail, Sandager did keep a closer eye on the place. He was suspicious of drug activity. He asked the sheriff to check the farm. At one point he started legal proceedings to evict the man. He dropped the effort though. He says he stopped because there were children involved. "They had two younger kids. They're in school, you know, and so I had felt a little obligation that I didn't really like to kick them out until they had at least finished school. And so I kind of let things drag," says Sandager. The price he paid for a drug-involved tenant has been felt by other property owners in Minnesota. Sitting at his table Sandager sweeps his arm in a wide arc. He says there's been several drug busts within a few miles of his home over the last decade. It's a problem common to rural Minnesota. Lawmakers think they've dealt meth making a setback by banning access to key ingredients used to cook the drug. However the drug itself is far from vanquished. Large quantities move into the state from places like Mexico. So when it shows up in a rental house maybe the landlord shouldn't be surprised, but try telling that to Craig Wokson. "It's been a learning process. It's been a nightmare," says Wokson. Wokson helps manage an old farm his mother owns in southwest Minnesota. He lives 180 miles away in the central part of the state. He rented the farmhouse to tenants. Law enforcement found a meth lab at the home last October. In this case, Wokson had no hints beforehand of drug activity at the farm. He says at one time he considered the house a possible retirement spot for himself. "As far as today's plans are, that's going to go up in smoke," says Wokson. "It has to be destroyed because of the meth lab the renters had in there. I have two options, I can have it cleaned to the tune of almost $11,000. Or have it destroyed." Wokson says his biggest frustration is dealing with the property left behind by the renters; things like clothes, appliances and tools. He says he can't just destroy them and risk being sued. He's working to get the individuals back on the farm to claim what they want. Then he can take the house down. Wokson says he's had problems getting information on what his responsibilities are. "I'm going to have the ear of a legislator I can tell you that. I'm going to go on a crusade," says Wokson. "It's too late for me, but for the next guy. There just needs to be some clear direction for people. From the Department of Health to law enforcement nobody seems to really know what you can do and what you can't." Like other property owners in this bind, Wokson feels betrayed. In farm country, a lot of economic activity is based on trust. It speeds up deal making and reduces expensive paper work; things like leases, background checks, legal notices. Each meth bust squeezes a little more trust out of the system. As others hurt by drug crimes can testify, property owners may have to become more suspicious for their own good.